WELCOME TO 45 CAMERON! DOWNTOWN MONCTON! 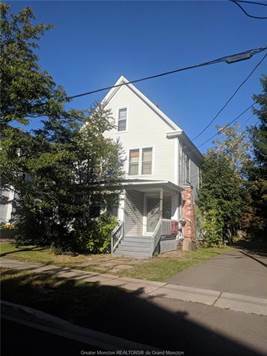 $41,800 BELOW ASSESSED VALUE! 3 TWO BEDROOM UNITS AND ONE UNIT THAT WAS USED AS OFFICE SPACE! AMPLE PARKING! WALKING DISTANCE TO THE NEW CONVENTION CENTER! ZONED SBD! LIVE IN ONE UNIT AND HAVE THE OTHER UNITS PAY YOUR MORTGAGE OR JUST HAVE THE PROPERTY AS AN INVESTMENT! APPROXIMATE MORTGAGE PAYMENTS OF $883/MONTH WITH AN INTEREST RATE OF 3.34% OVER A 5 YEAR TERM WITH AN AMORTIZATION PERIOD OF 25 YEARS! CALL YOUR REALTOR® TODAY! Directions: Cameron is off Main Street.